For IF: I'm posting Tokyo Subway for this week's topic, which is artificial, for the light in the subway. Since I last posted, I've been to Japan and South Korea, and briefly attended woodcut workshops in both, and I just got back from an intense week of learning lithography at Ox-Bow, with a wizard named Mark Pascale, who is also the curator of prints and drawings at the Art Institute of Chicago. I learned a ton, and found out that litho is mysterious, an almost alchemical process that is a big puzzle. I probably won't be able to leave it alone, now that the puzzle has been posed to me. 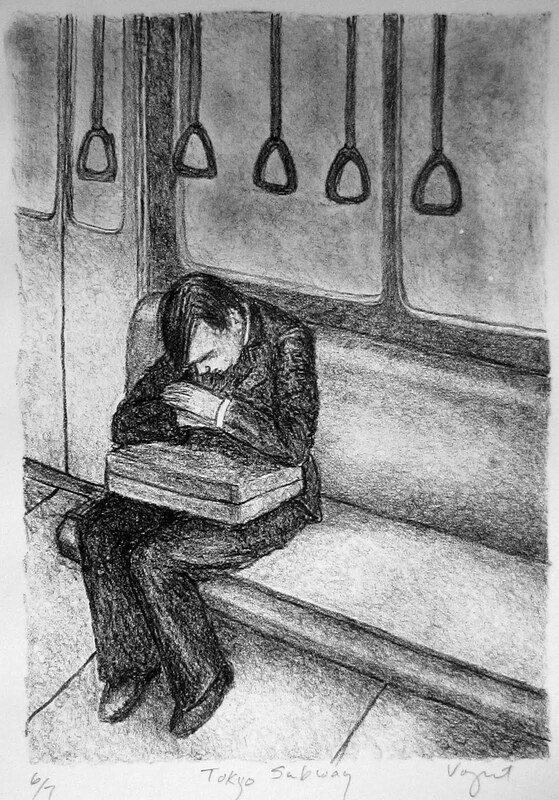 I made two prints, one is a simple litho crayon drawing of a scene I saw over and over in Japan and Korea: salary men in dark suits, nodding off on their commute on the subway. The next is a tusche and crayon drawing. The image floated before my eyes shortly after I found out about the puzzle of litho. 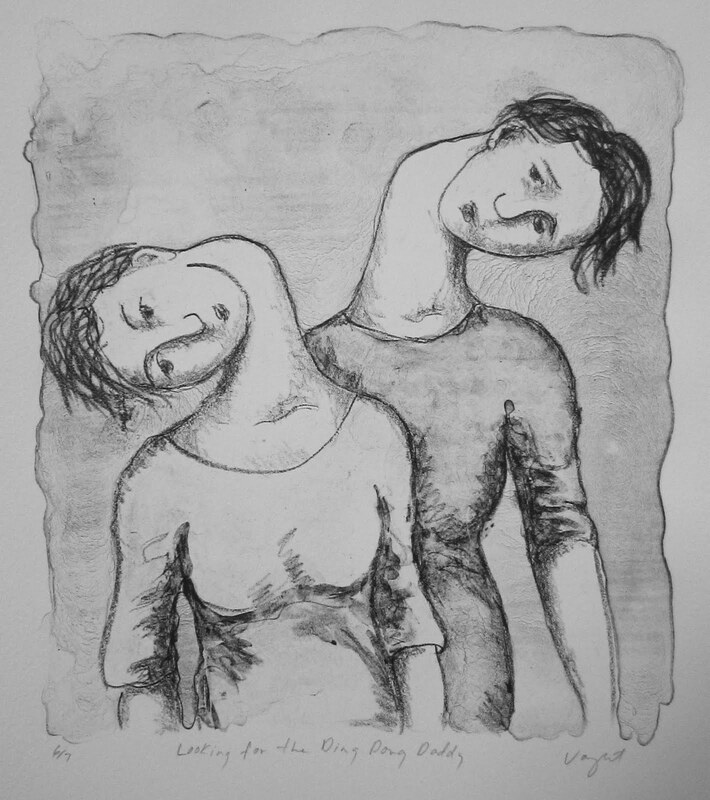 The title, "Looking for the Ding Dong Daddy" comes from the name of an intense acid wash of 36 drops of nitric acid to an ounce of gum arabic. A normal acid solution is about 8 drops. Mark told us that the term comes from a San Francisco cable car conductor who had a distinctive bell ring, and it was adopted by an artist who named the etch after him. I'm going to look this up again, to make sure I have my facts straight. Novice that I am, the tusche wash is very light, and the image looks a little burned out. But, oh, well. Live and learn. I have a feeling I'm at the beginning of another very long journey. Beautiful prints! And the first one works well for this week's IF word. You've captured two typical scenes of Japan so well! Glad to hear you had a good trip. Thanks! It was a lovely trip, and the remembering and processing has just begun. Thanks for visiting! Are the ladies with the lazy heads to one side Japanese ladies in their humble bowing of heads to one side?